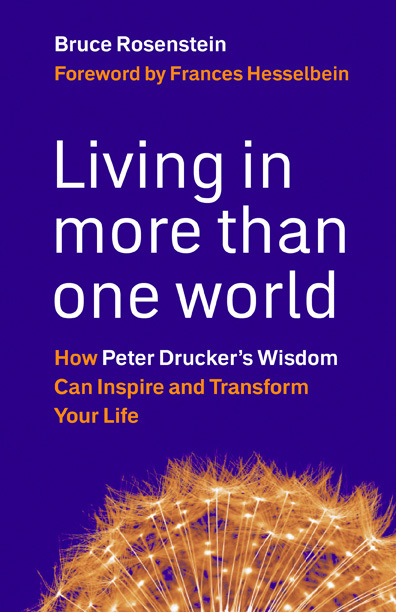 Bruce Rosenstein is the author of Living in More Than One World: How Peter Drucker's Wisdom Can Inspire and Transform Your Life. He worked for USA TODAY for many years, and now is managing editor of Leader to Leader, a quarterly journal. Q: When did you first get interested in writing about the management consultant and professor Peter Drucker, and how did your work become a book? A: I wanted to write about Drucker when I began reviewing business and management books for USA TODAY in 1996. I had been studying his work seriously for a decade at that point. Eventually I wrote about a number of his books, as well as a couple about him, for USAT between then and when I left in 2008. I interviewed him in person, in Los Angeles, for a USAT feature story in 2002. That experience emboldened me to write a book about his work focusing on the individual, not the organization. He was considered to be the “father of modern management,” but I wanted to write more on his ideas about self-management. I interviewed him several times for the book, but he died in 2005, four years before it was published. I also interviewed a number of his former students, family members, teaching colleagues and consulting partners. It was a long process from the initial idea in 2002 to eventually getting a book contract in 2008 and then publication the following year. It has since been published in Brazil, China and Japan. Q: What is the significance of the title, Living in More Than One World? A: That was a wonderful metaphor that he used in one of our interviews for the book, in 2005, at the Drucker School in Claremont, California. It refers to having a number of areas of activities in your life, so you are not overly dependent on any one thing for life satisfaction or support. You could be in one world at your main area of work, but also in the ‘academic world’ if you are teaching part time, and in the ‘museum world,’ if you are volunteering at that type of institution. You interact with a variety of people in these different worlds, and they may or may not intersect with each other. It also means that if you have a setback in one area (particularly at work), you can draw strength from other parts of your life, and the people within those parts. You can always look for additional dimensions to add to this life diversification. In the book I broaden the idea into my concept of one’s “total life,” and a running theme is the Total Life List. Q: How much do you think someone needs to know about Drucker before reading your book, and why? A: I wrote the book in such a way that readers do not have to have prior knowledge about Drucker. I included a consider amount of material to get people "up to speed" about Drucker’s life and work, so they can make the most of his principles and apply them in their own life and work. Q: What would you say are the most important lessons to learn from Drucker's approach? A: It’s important to remember that Drucker practiced what he preached, with a diversified work and personal life. He taught at a school named after him, consulted for both businesses and nonprofits, and he was an accomplished and prolific author. He had many ‘outside interests,’ including an intense involvement in the world of Japanese art. Plus he was married for 68 years (to a remarkable woman, Doris Drucker, whom I interviewed for the book and for USA TODAY and who is still going strong), with four children and six grandchildren. Beyond the area of life diversification, some of the other most important lessons are to be serious and organized about lifelong learning, to consider teaching (however that is incorporated into your life) as a crucial part of learning, to be generous with your time and talents, to be serious and organized about your approach to the future, and to continually assess how you are making a difference in the lives of others and making the world a better place, even in a modest way. In addition, article-by-article, book-by-book, etc., he built a considerable body of high-quality work over many years, a skill that many in today’s generation of knowledge workers (a term Drucker coined in the late 1950s) will need to cultivate. A: My experience as managing editor of the quarterly journal Leader to Leader has given me an additional perspective for my work as an author; as I work on my second book, Create Your Future the Peter Drucker Way. It will probably be published in October or November, 2013. A: In the ‘70s and ‘80s, I wrote about and worked in various capacities within the rock music world. On occasion, I still write about rock on my blog, Living in More Than One World. In 1980, Steve Leeds (who is now with Sirius/XM Radio) and I had our own independent record label, Ambition Records. We released one of the first compilations of independent label rock, Declaration of Independents. It was only on vinyl! Take Your Child to a Bookstore Day--Today!